Transportable furniture that’s not all as it appears? You bet, click on through to find out who and where. The Sand For Kids MM3 Low Rolling Cabinet is positively heavenly – a petite sized piece with a sleek timber exterior, you can hide a complete disaster of board games, toys, clothes or tech gear within the shell and be absolutely none the wiser when it’s closed. Ample storage is offered upon opening of the cabinet, revealing two tier shelving and two drawers on either side. 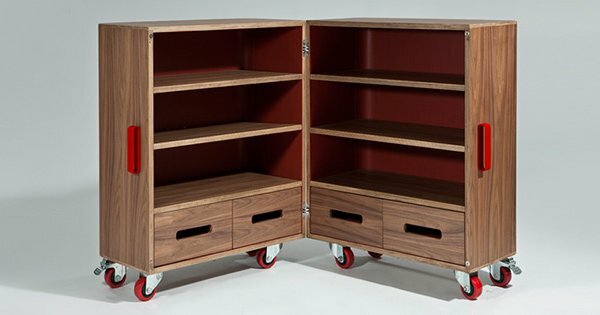 It’s a cinch to move also thanks to the brightly coloured rubber castor wheels and handles, enabling you to easily shift it wherever you need it then lock it in to place. I can’t not mention how much I adore the old library style of the Books On Wheels unit. 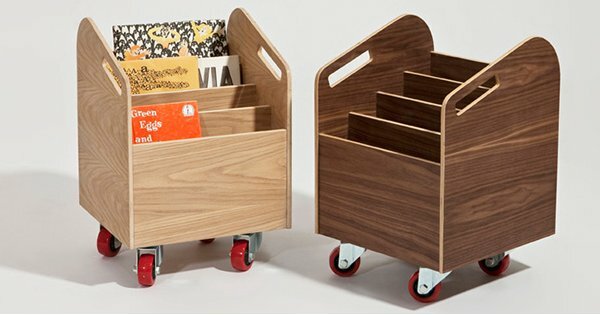 My children would love nothing more than to load this up with their favourite reads and push it around behind me all day long, accompanied with incessant nagging to read just one more until I give in. A great way for children to share and move books in an orderly fashion (one can dream) between play areas and bedrooms without leaving a trail of books behind them. Sand For Kids has quite an impressive line up of furniture and accessories. Some pieces are available online in their shop and they will ship to Australia. It’s worth getting in touch with them to find out about availability of specific pieces, as at the time of writing they don’t have an Australian stockist.